A cell is the simplest and smallest unit of life. All living things are made of cells. Some living things are made of only one cell; however, most of the living things we are familiar with including plants, animals, even humans are made of many cells. The human body is made of billions of tiny cells each surrounded by a selectively permeable membrane . The cell's membrane separates the cell from everything that surrounds it. The cell's membrane is "selectively permeable" since some things can pass through it easily, while other things will not be able to pass through it very easily or at all. A hard outer shell surrounds all chicken eggs. But did you know that underneath that shell is a membrane similar to what surrounds cells? In this experiment, we will take advantage of that fact by removing the shell to more closely examine a membrane. Have you ever placed ink into water and seen the ink slowly move throughout the water? This process is called diffusion . Naturally, the ink will spread throughout the water until there is the same density of ink throughout the water. The ink will be completely diffused through the water when the ink is completely evenly distributed throughout the water. Another similar process is called osmosis . Osmosis is simply diffusion through a membrane. Substances will naturally try to "even out" meaning that, if they are able to move through the membrane, they will try and obtain the same density on either side of the membrane. Substances will move from an area of higher concentration (or density) to an area of lower concentration through the membrane. Once the concentration is equal on both sides of the membrane, it is said that the substance has achieved equilibrium. Imagine that the white dots are water molecules and the black dots are ink molecules. Choose the picture that represents a substance that has reached equilibrium. What if the for some reason the ink was unable to pass through the membrane? Will the substance ever achieve equilibrium? Why or why not? This activity is completed in three parts. It is suggested that the first part of the activity is done in the afternoon or evening, the second part of the activity can be done the following afternoon or evening, and the third part the following day. Place each of the 4 eggs in a separate glass. Pour vinegar inside each of the glasses so it completely covers each of the eggs. You may like to cover the glasses with foil or plastic wrap to reduce the smell in your refrigerator. Place the eggs inside the refrigerator for approximately 24 hours. 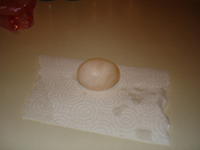 The vinegar will react with the eggshell and remove it, leaving only the inner membrane. The eggs will look like the one below when the shell is removed. It is ok if all the shell is not removed, as long as the majority of the shell is removed. Empty the vinegar out of each of the glasses and wash them thoroughly. Lightly rinse each of the eggs with water. Place the eggs back into the glasses. Label each of the glasses 1 thru 4 and use the table provided at the end of this activity to keep track of the four different eggs. Measure each egg around at the widest point using a tape measure or a piece of string. To use a piece of string, Take a piece of string and wrap it around the egg once. Mark with your finger the length of string that is needed to go around the egg once and measure it using a ruler. Record the length around for each egg using the table provided. Cover one egg with water, one with water and a drop of blue food coloring, one with molasses, and one with corn syrup. Place the eggs back inside the fridge. You may also like to cover the glasses with plastic wrap or foil to lessen the smell. Wait several hours (such as until the morning) to see what happens to the eggs! Carefully remove the eggs from the substances and rinse them carefully with water. Just as before, measure the eggs around at the widest part using either a tape measure or string and a ruler. Record the measurements in the appropriate part of the provided table. Finally, place the eggs back inside the glasses after they have been properly washed or place them in new cups or glasses. Use a toothpick to carefully pop each of the membranes of the eggs. What did you notice about what was inside? Did any of the outside substance make it to the inside of the egg? Record your observations in the appropriate space in the table provided. Answer the following questions:Examine the changes in the width of the eggs. In which substances did the width of the eggs increase? Decrease? Remain the same? What does an increase in the width of the egg mean about what must have happened? How about a decrease in width or if the width remains the same? As you can imagine, if too much water rushes into the egg due to osmosis this could cause the egg membrane to pop! This occasionally also happens to cells in our body. The membrane of a chicken egg has many similarities to the membrane surrounding animal cells. However, the only process that could be observed here is called passive transport. This means that the cell did not use any energy to move things through the membrane. Another way living cells can move things through the membrane is active transport. In active transport, the cell needs to use energy to move things through the membrane. Use the resources listed at the end of this activity to research all the different ways the membrane can move things through the membrane. You probably noticed that the width of some of the eggs remained the same, some of the eggs increased in width, while others actually had a decrease in width. In the case of each of the eggs, water was the substance that was able to move past the membrane. In most cases, water molecules are the only things allowed to pass through an egg membrane since it is the only thing small enough. However, with careful observation you may have noticed that some blue food coloring also made it past the egg membrane. This is because it is also small enough the pass through the membrane. If the egg decreased in size, as was probably the case with the molasses and the corn syrup, then water must have moved out of the egg through the membrane. This must be due to a lower concentration of water outside the egg in the molasses or corn syrup than inside the egg. If the egg increased in size, as what likely occurred with the plain water and the blue water, then water must have moved into the egg. You may have also noticed that the blue food coloring also made it inside the egg when you popped it. This is because the blue food coloring is also small enough to easily pass through the membrane. Just like in the molasses and corn syrup cases, the water moved from an area of lower concentration to higher concentration; however, the lower concentration of water was inside the egg in the plan water and blue water cases. What Was Inside the Egg?